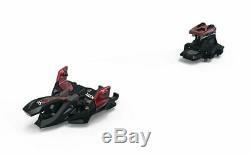 Marker Alpinist 12 2019 Ski Touring Bindings Black / Red. The ultra-light and durable touring pin binding for high alpine challenges with DIN settings up to 12. The ultra-light pin binding (245 g w/o brake) offers active length compensation during ski flex and an impressive power transfer downhill due to a 38 mm drill pattern. The carbon-reinforced toe provides great stiffness and comes with anti-ice pads and integrated elastomers for easy stepping in. The heel features a climbing aid with 0°, 5° and 9° angle and allows super convenient switching between hike and ride mode. Weight : 245 g w/o brake, 335 g w/ brake. Din/ISO Range 6.0 - 12.0. Skier's Weight 40 - 110 kg. Integrated elastomers serve as visual aid and allow easy stepping in. Anti-ice pads prevent icing of toe and heel. Length adjustment up to 15 mm +/- 7,5 mm. Only 245 g due to ultra light construction. Easy to use climbing aid (0° / 5° / 9°). 0° walking mode for long, slightly elevated ascents. Fast shift mode for super fast angle changes of the climbing aid. Easy mounting of the crampon, available in 4 widths. Perfect power transfer thanks to a 38 mm drill pattern. Maximum stiffness due to carbon-reinforced toe components. Length compensation of the ski flex. Adjustable horizontal release with DIN-settings 6 - 12. Fast and simple switching between hike and ride mode. Brake (optional): The optionally available brake comes in three different sizes for various ski widths (90 / 105 / 115 mm). It automatically locks in walking mode with the very first step and reactivates when switching back into riding mode. Their pronounced retraction brings the arms of the brake very close to the ski. 2004 Real Shop With Real People! The item "Marker Alpinist 12 2019 Ski Touring Bindings Black / Red" is in sale since Tuesday, February 19, 2019. This item is in the category "Sporting Goods\Skiing & Snowboarding\Downhill Skiing\Ski Bindings". The seller is "snowlabshop" and is located in East Sussex.